I have an 18x33 Oval Pool, with 7 A-Frame braces on each side - installed in 7/2006. There is a u-shaped deck built around the long side (closest to the house) and both curved sides of the pool, with the far long side open. On the house side of the pool (Long side), the ground was excavated from 16 to 20 inches as the ground slopes high to low away from the house. The pool installer recommended to back-fill against the pool about 8-12 inches, and stated that the excavated earth would slowly erode (slope) towards the pool (This did occur). 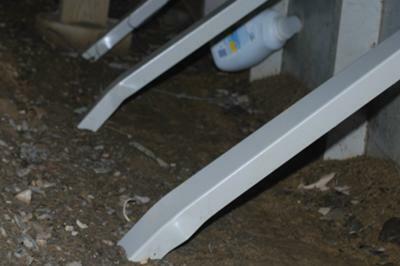 This spring, I noticed that five of the braces under the deck have bent about 12-16 inches from the ground level - about 4-6 inches above ground level. Every Fall, after winterizing the pool, I drop the water level to just below the skimmer. I am also diligent in removing excess water / snow melt off the cover during the winter. What would cause the A-Frame braces to bend like this? The pressure of ice up top during the winter? The pressure of the earth on the brace & cement block? What is the best way to repair/replace these braces? Do I need to drain the pool in order to repair/replace the braces, or if I did one brace at a time, would the remaining braces be able to support the wall? I read that you suggested using 2x2 treated lumber as an insert for additional strength. Any suggestions would be appreciated - Thanks in advance. Hi Mike. You will need to reinforce the braces with something, either lumber or a steel L-channel. That is after you straighten them. Once a brace is bent like that it will easily happen again unless it is strengthened. I would not blame the installer, but it does look to be weather related. Either the ground pushed up from the freeze or the ice in the pool pushed out. But once the braces are fixed it will probably not happen again. I think you will need to lower the water level to just below the half way point, may a little more. This should allow you to remove and repair the brace angles one at a time. Your situation sounds like ours. Where can you get new braces. We have been looking. Hi, we have an 18x33 above ground pool. We just noticed that 2 of the braces have buckled after we filled it, the pool is approx. 16 years old. Can these be repaired or is the pool done? Is this something we can do our selves and can we even buy the braces for this? Is it expensive to have a pro come and do it? We were told that we might have to empty the pool and then our liner will be done as well, Is this true? Thank you for any help or advise you can offer! Hi If you drain the pool all the way you will probably loose the liner. 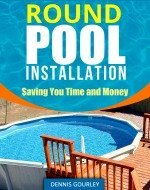 You might be able to do the repairs yourself and only have to drain the pool down to a foot or so, this would keep the liner from shrinking. You will need two strong people to push the wall in while you remove and replace the brace. You could reinforce it with lumber or steel channel or you might be able to have one made. Anything is possible but I would not toss the whole pool just because a brace is buckled, I would fix it. Thank you for the information! On the weekend we re-enforced the braces by putting 2 x 6's along the sides of the brace for extra support but only as a temporary fix. Our thinking is because the ground has shifted so much over the winters we will need to re-set the entire pool which will be a large expense.